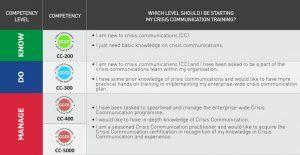 BCM Institute’s crisis communication (CC) certifications are available for all professionals who would like to get their crisis communication experience and competency validated by an independent crisis management certification body. This program is exceptionally relevant to business continuity management (BCM), crisis management (CM) and IT disaster recovery (DR) professionals who hold responsibilities in driving the decision and messaging during a crisis or disaster. Certification would then be awarded once the independent certification body is satisfied that all conditions are met. Certifications are then valid for one year after which yearly renewals are needed to ensure the validity of the certification.